SupraStore Brand Parts - The ultimate fair priced fully assembled 3.4 Liter 2JZ Stroker! Now includes Titan main caps, fully fitted!! Home POWERHOUSE RACING, SUPRASTORE & MORESupraStore Brand PartsSupraStore.com 3.4 Liter 2JZGTE Stroker Shortblock Fully Assembled! SupraStore.com 3.4 Liter 2JZGTE Stroker Shortblock Fully Assembled! We love our 3.4 liter fully assembled shortblock, which uses the BC 94mm crank, custom JE Ultimate Stroker Pistons (select compression)and your own rod choice depending upon power expectations and application. Why spend $15,000+ for a 3.4 liter short block, when we offer the exact same components (lets face it, everyone uses the same components) and many of the same machine shops everyone uses. Truth be told not a single major Supra parts business has it's own machine shop, us included. Once we understand the application of the motor (race only, fast street car, etc), then we machine the block with the tolerances required. Upon completion assembly begins and all tolerances are checked and then double-checked. Crank has already been confirmed rotationally during high-speed final balancing. Pistons weighed, rods weighed. Rings are hand filed and all torque settings done using SnapOn instruments. You end up with a professionally assembled motor ready for install. We use the same guys and just give you options with standard BC rods, Eagle, Pauter X-Beam (we love them), Manley Turbo Tuffs (I or H) or Carillo H-Beams. At SupraStore.com we have always strived to bring you the latest products and performance components for the absolute fairest value without any sacrifice in quality or performance. The same holds true on our fully assembled 2JZGTE stroker kit fitted inside a seasoned Toyota shortblock. This is the same kit powering some of the worlds fastest and quickest Supras. The naysayers from long ago said the motor would never rev out well. How does 9500 rpm (with right combo of machining, parts & tuning) sound for a stroker kit? The additional .4 liters over the factory 3.0 liter motor makes a significant difference in energy production, which in turn powers the largest of single and twin turbo combinations. The torque curve has also shifted downwards to make the car more driveable on larger turbo set-ups. Plus, the additional .4 liters with a free flowing exhaust just sounds MEAN! There is no sound like a SupraStore.com 3.4 liter stroker kit. Designed by the pro's in California this true billet 4340 crankshaft, with an 8mm increase in stroke to 94mm, this increases the supra displacement in conjunction with custom big bore, big pin, coated ultimate stroker pistons by almost a half-a liter! Couple the stroke increase with the inclusion of stroker and big bore specific-designated pistons in 87mm (various compressions can be ordered) and we have created a 3.4 liter building block to unleash new levels of power, quicker turbo spooling and torque that Supra enthusiasts the world over have yearned for. We include billet main caps with the necessary machining and assembly to assemble an ultra robust rotating assembly, capable of big hp and as much rpm as your head is designed for. The combination of a higher compression ratio than the stock motor (8.5:1) and the .4 liters of additional volume are PROVEN to spool turbos and make power unlike any 3.0 liter motor. For those running E85 or any high fractional component of ethanol, then you can really bump the compression up and see significant advantages in torque. 9.0:1 to 10.5:1 is the standard range for E-fuel motors. We are using the highly updated Titan Motorsports ultimate stroker piston set, highly upgraded wrist pins, not generic pistons. Meticulously measure and set all bearing clearances and measure piston to bore clearances using the best measurement tools in the industry. Fully assemble shortblock, wrap and prep for shipment. There are four significant advantages of the SupraStore.com Big Bore Stroker over the competition. The utilization of the billet crank is superior in materials choice and final robustness over the forged crank assemblies used by the others, allowing more rpm if needed. Pro racers are 9,500 rpm plus. 9000 rpm on a properly assembled street motor is possible. JE or CP Ultimate Stroker Pistons (you choose compression) are at or near the absolute pinnacle of the piston world when it comes to quality, design and materials selection for high performance useage. Ours include free dome and side skirt coating to help increase robustness and decrease friction. These pistons ONLY work with 94mm stroker crank, as they are custom designed not only in compression, but in pin location for the rod. The ability to special order custom-compressions, which are not available with the other brands is an excellent feature. The rings and ring landings are standard for JE and are readily available. Break a ring on the HKS stroker kit and you are WAITING for a long time for a custom built ring from HKS Japan. Simply put, the SupraStore.com Stroker 2JZ kit is positioned in the pricing department to offer the first truly afforable Big Bore and Stroker Kit for the 2JZ. Priced well below the the competition, this offers the end-user outstanding value. We use all the big name parts and save you money! Long the achilles-heel of many of the Japanese companies is product availability. Many of you understand that most of these companies simply do not bring enough product to the States to meet the demand. The other kits are no exception with it's "special-order" ONLY status from Japan. Delivery times of 6-12 months is not uncommon. Our kit is designed,manufactured and assembled in the USA which reduces lead times substantially. Delivery times as low as 3-4 weeks (due to custom piston order) are possible. •Toyota Shortblock Magnafluxed (seasoned) * Add $1450 for outright purchase (price is based upon using your block). We fully assemble the motor, provide all parts and palletize and wrap the short-block, so all you have to do is arrange freight. 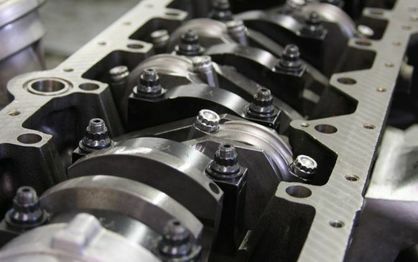 In order to install the billet main caps, they need to be torqued properly in the block and machined in a process called line boring. Please see the video below to get an idea of what line boring is and how it is done. Line boring can be done by any fully equipped shop with the proper line boring set-up. Email or call to discuss your build. Typical build time is approximately 4-6 weeks, so plan your project accordingly.